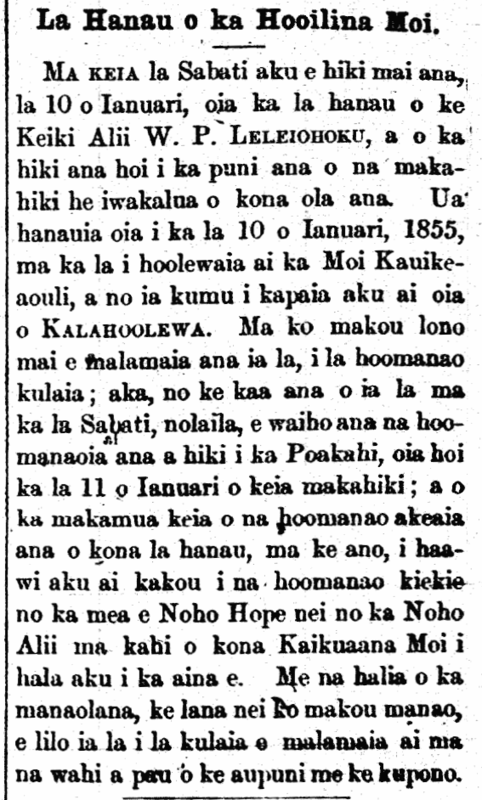 Na olelo ponoi o Kalani Kalakaua ma kona la hanau, 1874. Ua lawe mai au i keia la, oia hoi kuu la hanau, i la hoomaikai i ka Mea Mana, no na pomaikai o ko kakou ola kino a kokoke i ka puni o keia makahiki. A ano ka mea hoi, ke kokoke mai nei ka manawa o Ko’u holo ana aku i na aina e, e imi i ka pomaikai o na hana nui a ko kakou aupuni; ua puili ae au i keia wa, e hai aku i Ko’u aloha ia oukou e na makaainana. Ke hele nei au e hooko aku i ka mea a ke kau Ahaolelo i hooholo iho nei. King Kalakaua’s expected treatment in the United States, 1874. To King Kalakaua will go the honor of being the first ruling monarch to travel to the Nation of the United States of America since it was established as a nation. He will meet with a very grand reception greater than anyone else who has gone there. King Kalakaua’s address in English, 1874. Sanford B. Dole, the Congregationalists, and Annexation, 1902. On Monday evening, April 28 last, Governor Dole was the guest of the Congregational Club of Boston. Elsewhere in this issue will be found a sketch made by Dole of the Hawaiian situation. It is characteristic of the man. Having the full support of the Administration behind him he is not afraid to say in public what he has been thinking in private for many long years. Let us see and take up his points one by one. Point No. 1.—”The monarchy was overthrown and annexation was accomplished for the sake of good government for the islands; that is, for their benefit.”—It is true! Annexation was accomplished, by a handful of Congregationalists because the reciprocity treaty between the United States and Hawaii was in imminent danger of being abrogated. The monarchy was overthrown, so as to save the $40 per ton duty on sugar. It was then as it is now for the Congregationalists:—Money before principle.